Regular ambulatory movements for the patients are essential to prevent circulation and mobility problems. Several patients encounter difficulties in standing up or walking on their own. Slipping or stumbling, particularly for the aged persons, may prove very dangerous. In order to assist such patients in moving, transfer belts are used. This article covers the correct procedure to assist the patients to ambulate using transfer belt. Adjust the patient’s bed to the lowest level. After adjusting, lock the wheels. Before initiating this procedure, wash your hand. Support the patient in sitting on the bed. Position him/her in such a manner that his/her legs hang over the edge of the bed. Allow the patient to remain in this position for a short time period. It will ensure that the patient is stable and is not feeling dizzy. Apply transfer belt on the waist of sufferer. Stand in front of the patient and assist him in standing up. Tell the sufferer to put his hands on the bed beside the legs and his feet on the floor. While grasping transfer belt with an underhand grip, instruct the patient to bend forward. Put your feet next to the patient’s feet. Now, slightly bend your knees. Gently lift the patient and help him to stand up. Allow him to remain in this position for a short moment, in order to ensure that his/her respiration is stable and he/she is not feeling dizzy. Provide a cane or walker, once the patient gets stable. Tell him to hold it, using his strong side. Stand on the weaker side behind the patient and help the sufferer to walk. Don’t forget to hold transfer belt with an underhanded grip. Carefully monitor the patient, when he walks. Stop him from walking, if he feels tired, dizzy or any problem in respiration. Allow the patient to walk at a comfortable pace. Let him to rest, until he feels prepared to walk again. Assist the patient in getting up from the chair in the similar manner as you did while standing him from the bed. Remove transfer belt, as the patient returns to the bed or chair. After completing the procedure, wash your hands. Wash your hands before and after applying and removing transfer belt. Before starting the procedure, help the patient to put on comfortable and warm clothing. Make sure that the patient is wearing slippers or rubber-soled shoes. Ensure the availability of wheeled IV pole or portable oxygen cylinder, in case your patient needs an IV or oxygen. Don’t rush the patient to walk. What Does an Examiner Observe When You Assist the Patients to Ambulate Using Transfer Belt? The examiner notes the following things when you perform this skill. Tip- The first thing you need to do is washing your hands up to the wrist in an appropriate manner. Then, as you enter the patient’s room, greet him/her and tell what you are going to perform? Whether you locked the wheels? Tip- Lock the wheels of the chair or bed. If you have made the patient to wear comfortable attire? Tip- Assist the patient to don warm and comfortable outfit. Also check that the patient is wearing slippers or rubber-soled shoes. If you applied transfer belt at the right place or adjusted it appropriately? Tip- Apply transfer belt firmly around the waist of the patient, in such a manner that you (or examiner) can insert two of your (his) fingers in between the patient and the belt. How you assisted the patients to stand and walk? If you stood alongside the sufferer’s affected side? Tip- Don’t forget to stand on the weaker side of the patient. Make sure that the patient stand erect with back straight and head up (if he can tolerate it). Walk slightly behind and to the side of the sufferer. Held transfer belt with an underhand grip. If you prevented the situations, in which the patient could shuffle or slide? Tip- Monitor the patient, when he begins to walk. Stop the person from walking, if he fells dizzy or any change in respiration. Whether you ambulated to the requisite distance? Tip- Allow the patient to walk to that much distance, up to where he can tolerate. Allow him to take some rest, till he gets ready to move again. Whether you assisted the patient in returning to chair or bed? Tip- Don’t let the patient to walk alone (i.e. without your help). Support him in returning to chair or bed. If you removed transfer belt correctly? Tip- When the patient returns to chair or bed, take out transfer belt. Whether you performed completion tasks or not? Tip- After completion of the procedure, rinse your hands and dispose the paper towel. 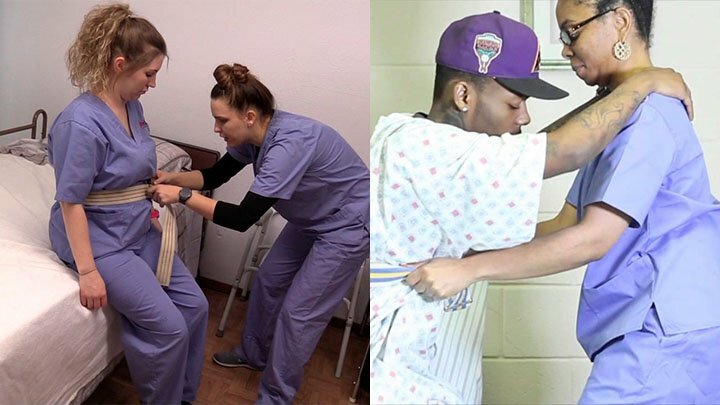 According to experts, most of the CNAs don’t know how to apply a giant transfer belt. Inappropriate application of the belt may injure your patient or yourself. Therefore, it’s essential to be very careful while using it. They assume that transfer belt can help the patient to walk for longer distances. In fact, transfer belts are designed for assisting the patients to move for shorter distances, without much help from others. However, physical therapy is an exception to this rule. Applying belt on patient in such a manner that it touches his skin is one of the mistakes most of the students demonstrate during practical examination. This may lead to tears and serious wounds in the person’s skin. Apply it on the clothes only. Let the patient to assist (no matter how small that assistance is) you. Allow him to perform movements himself. Don’t try to bear his weight on your own. It may injure your body and you might have to leave your job. You would even not get any compensation because you are wounded on the job due to your fault (i.e. improper handling of the equipment). Therefore, it’s better to understand the rules and remain on your safer side. The below given video will make you clear how to assist the patients to ambulate using the transfer belt. Watch it.